The House of Commons Environment, Food and Rural Affairs Committee has said the UK government should allow all water companies to implement compulsory metering, and set a cross-government target for per capita consumption reduction over the next 25 years. Waterwise is an independent not-for-profit organisation based in the UK with the vision that water will be used wisely, everyday, everywhere. 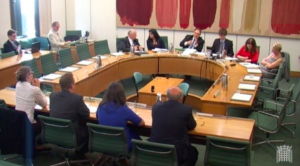 We responded to the House of Commons Select Committee Inquiry on Regulation of the Water Industry and on 20th June our MD, Nicci Russell, gave oral evidence – alongside the Chartered Institution for Water and Environmental Management, the Blueprint for Water NGO coalition and the Homebuilders Federation. Find the link to the report, and oral and written evidence here. Find more information on Waterwise’s Water Efficiency Strategy for the UK here.